Maybe you’ve never considered this, but Rock n’ Roll has provided small group leaders with quite a bit of wisdom. Over the last week, I’ve been posting #rocknrollwisdom as my Small Group Leadership TIPS of the week on Twitter, my Small Group Leadership Facebook page, and LinkedIn. The genesis of all real wisdom comes from the Creator, who uses all kinds of means to get our attention. How many R&R titles can you find? Many groups have forgotten The Heart of the Matter. They Come Together for fellowship and to Read the Book, and that’s Fine as Fine Can Be, yet God is simply a Spirit in the Sky, and Jesus is Just Alright. They may say I’m a Believer, but the Lost? Dream On! Love your neighbor? “What’s Love Got to Do with It?” they ask. When a visitor happens to show up, their attitudes are, “Hey You, Don’t Stand So Close to Me!” Ain’t It a Shame? Yes, It’s a Plain Shame! God Only Knows what he can do in and through your group, so Don’t Stop Believin’ in him. Say a Little Prayer and tell God, “I’ll lead this group Anyway You Want It.” In fact, instead of leading under your own Authority and Power, lead as if you’re Livin’ on a Prayer. 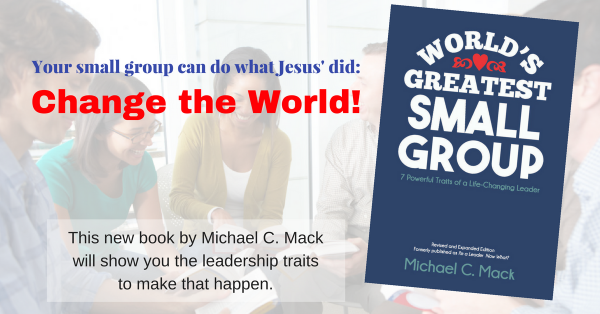 Small Group Leaders, it’s time to Shake It Up! Yes, continue to Faithfully Shower the People You Love with Love. But Let Your Love Flow to people outside your little group as well. Invite new people to your group. Tell them, “You can Come as You Are, yes Just the Way You Are,” and then Let ‘Em In and welcome them with Open Arms. Now here’s a little Caution when you tell your group there’s Gonna Be Some Changes Made … Changes in Latitudes (because you’ll need to Get Off your comfy couches to actually do what the Bible says) and mostly Changes in Attitudes. Be the Leader of the Band, the Leader of the Pack, and tell your group members to Walk This Way. It may not be Easy, but Keep on Rollin’ with the Changes and Don’t Look Back. It may Feel Like the First Time you’ve actually lived as a group on God’s mission! Make Christ’s mission to Go Now and reach lost and Lonely People Urgent for your group. It’s really A Matter of Trust for the people in your group, so Don’t Fear the Reaper. Remind your group that with God, Nothing’s Gonna Stop Us Now. No Way. Ain’t No Stopping Us Now! So until you’re climbing that Stairway to Heaven and Knockin’ on Heaven’s Door, Keep the Fire. Yes. Keep the Fire Burnin’ over the Long Run! As Always, Always and Forever, Love is the Answer. When Times Gettin’ Tougher than Tough, remember, you gotta have Faith. It may be true that You Can’t Always Get What You Want, but if you try sometimes well you might find you get what you need. I’m sure I’ve missed a few pieces of #RocknRollWisdom. Add yours in the comments! Dethrone These Top 10 Idols in Your Small Group!